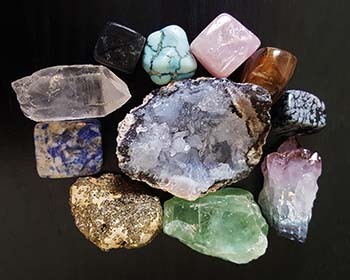 Cubic Crystal Systems can be formed as cubes (diamond, fluorite, pyrite), as octahedrons (diamond, fluorite, magnetite), as rhombic dodecahedrons (garnet, lapis), as tetrahedrons (pyrite, zinc blends), as pentagon-dodecahedron (pyrite) as well as others. This type of crystal system includes all crystals with a square inner structure. In the same way that this system is made up of a square, very regular structure, the lifestyle that matches it is also comprised of a very regular structure. If you are leading a cubic lifestyle, rarely is anything left to chance. Everything you do will create structure in every part of your life, keeping each little part under control. At work or at home, everything has its place and you probably know where everything can be found if you need it. Daily rituals are kept and you take your commitments very seriously. Generally you will be very prompt, to the minute, or always late by the same amount of time. Either way, it's a punctuality you stick to. You enjoy planning well in advance so you can be sure to have all the details worked out in the early going. These are also very regular. You love well considered plans and always anticipate your next move. You can quickly grasp what's important in situations and try to create order - everywhere. When you find something to be sensible and effective, you will generally stick with it rather than go with any type of spontaneous experimenting. Logical thinking comes easy to you. Rarely is there any problem with keeping an overview of situations and you are systematic in searching for causes to things. Being precise and exact in your considerations will always provide your inner security and will strengthen you in any conflict. Cause and effect will always be evaluated in every circumstance, and even when a risk is taken, it will be very calculated. While you carry deep feelings for those people, animals and things you love or feel enthusiastic about, you will not be led by your feelings. If the situation is too unfamiliar, you will not take the risk of being pushed into actions based on feelings. Objectivity will not be abandoned and you will control your feelings and remain in charge of your life situations. Constancy is your ally. Preferred things are stuck with, even if that favorite shirt is falling apart. If you are keen on health, you never miss regular check-ups and stick to your regime of personal hygiene. These can be good things. Unfortunately, any bad habits can be just as persistent and your greatest weakness will be your lack of flexiblity. The failure of a well thought plan can create a crisis and temporary sense of disorientation. All of your self-made rules can become a problem if you can only live by those preconceived notions. Any change will become a threat, any criticism will be a personal attack and other lifestyles can become a danger to be fought against. A cubic lifestyle can allow for both negative or positive development. The start to developing the positive side is seeing your life patterns as part of a higher structure and the readiness to gain the opportunity to fit into the structures of family, work, nature and the laws of the physical and spiritual universe. You will not blindly trust in things, but can be ready to allow yourself to be persuaded by new possibilities. In your cubic fashion, you can become open to learning and connect every new experience with something already known. Your ability to create order can be employed in a way that will be helpful to others and yourself. Difficulties will become opportunities to be conquered, and problems will help you to learn and grow. Fulfillment will come with each successful idea. A person with a cubic personality that can foresee consequences and results at the time the action is taken will surely become successful with whatever they tackle.